One of these core values is undeniably inclusion, as Dartmouth pledges “not [to] exclud[e] any person of any religious denomination whatsoever, from free and equal liberty and advantage of education, or from any of the liberties and privileges or immunities of the said college” in its charter. Whereas this value seems naturally true for the 21st century, we must remember that the College has struggled to fulfill this value: the big fight for coeducation was not won until 1972. It is true that the College had its shortcomings, but the Board of Trustees made progress by gradually moving toward coeducation. The nomination of Pauli Murray, who would have been the first woman trustee if she had been selected, was a major step that raised awareness about the importance of expanding women’s roles at Dartmouth. Another tale regarding inclusion comes from one of College President Phil Hanlon’s presidency challenges, when a newly appointed dean of the Tucker Center, James Tengatenga, was rescinded in 2013 after claims that he not only failed to condemn but also condoned his home country of Malawi’s criminalization of homosexuality. According to an Aug. 15, 2013 Boston Globe article, rumors whispered that he “opposed the 2003 election of the Rev. Gene Robinson of New Hampshire, the Anglican Communion’s first openly gay bishop, and asserted in 2011 that Malawi’s Anglican provinces remained ‘totally against homosexuality’.” When Hanlon rescinded his offer, the College made a resounding statement that there can be no questionable stance on the inclusion of LGBTQ+ members among the community. A second core Dartmouth value addressed in its mission statement is the “vigorous and open debate of ideas,” a cherished tradition for all the faculty, students and alumni who spent their days in these colonial-style buildings. As a member of the Global Village Living Learning Community, I’ve personally felt the importance of this emphasis on intellectual discourse, whether it be discussing the issue of South China Sea with both Chinese and American floor-mates, deliberating about the U.S. elections or preparing with fellow students for the arguments we will run with at Dartmouth Model UN this spring. This culture is fortified by the presence of diverse student-run political groups like College Democrats, College Republicans, Mock Trial, Model U.N. and many more. However, Dartmouth can still do more to foster dialogue between students. Thanks to the College’s dynamic environment, this improvement won’t be coming late. 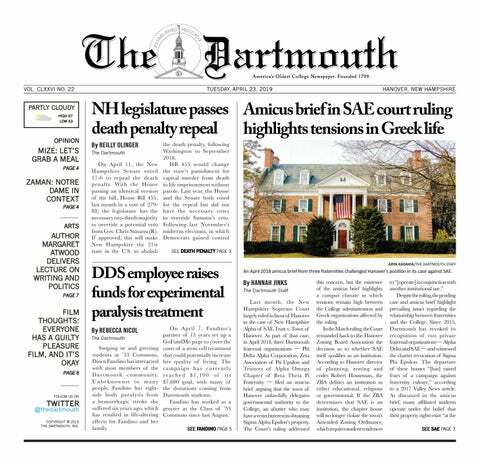 Just last month, the Dartmouth Council on Student Organizations reauthorized the formation of Dartmouth Political Union, a club that was formed in 2009 but later deactivated due to a lack of members. There are many more core values that come to mind, one of them being academic excellence, as many students would likely relate. Being a part of a liberal arts institution opens up not only an education of depth, but also one of breadth. Dan Reicher ’78 described his Dartmouth education as “open” and “broad” in an interview and stated that his education allowed him to range across many disciplines in his careers in energy and climate change. This is something that is likely true for many of the Dartmouth alumni and students, as Dartmouth allows students to modify majors, add minors and even add a fifth year for engineering students, making it possible to enjoy the richness of a liberal arts education and create an interdisciplinary mindset. For instance, the current first-year seminar I’m taking, Classics 07.09 “Narratives of Trauma and Suffering” studies both Greek tragedies and human psychology, whereas we learn about Greek heroes’ lives while making connections to the challenges of 21st century warfare. The connections we make not only allow us to internalize both disciplines separately but also help us apply it to real life. Though I’ve tried to cover as much as possible, the list doesn’t end here, and the core values take a different form for everybody. However, there is one thing that many of us can agree upon, regardless of how we define collegiality: we love dear old Dartmouth, and the granite of New Hampshire is made part of us ’til death.